TemplateHack.com - Download Arcade Responsive premium blogger template. 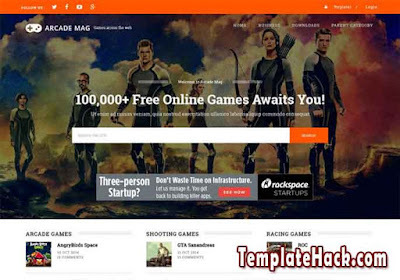 Arcade is responsive blogger template with landing page design. It is amazing blogspot theme with orange and white base color. With no sidebar and post thumbnails, you can use this template for any niche of blogs. It is customizable blogger template designed for business blog, portfolio blog, CV blog, company profile blog, tech blog, games blog, gamers blog, download blog, streaming blog, and any other with great landing page design. Use this template for your blog, get many benefit with the following features. Download this premium blogger template for free. Social bookmark ready, No sidebar, Email subscription widget, Dropdown menu, SEO Friendly, Ads ready, 2 column, Login, Registration, Post thumbnails, Responsive, Html5, Mobile friendly. Landing page blogger template, Business blogger template, Portfolio blogger template, Curicullum vittae blogger template, Game blogger template, Tech blogger template, Download blogger template, Company profile blogger template.